Today is my birthday. I am 30 years old. Looking back on my teens and twenties, I remember how absolutely freaked out I used to be about getting older. Every birthday that ticked by seemed like a cruel joke to a carefree young lady with cool clothes and perfect skin tone. Now, not so much. I think I actually like getting older because it seems like life actually gets better. If you’d told me this even five years ago I would have scoffed, but how true it feels now. I may be a little less cool in the wardrobe department and have crows feet teasing the edges of my eyes, but I’ve traded in those things for the realizing that those things don’t really matter anyway. What a relief. And what does a 30-year-old woman want for her birthday? A kid’s cake, obviously. I know that this one is a little over-the-top, but it’s time to celebrate the beginning of an undoubtedly huge decade ahead, plus I really had to one-up myself from last year (not an easy task, I might add). Chocolate and banana is one of my all-time favourite flavour combinations, and one that certainly hails from childhood. There is something so right about the mellow comfort of banana’s sweetness paired with deep, dark chocolate intensity. I am reminded of banana boats in the fire at summer camp, banana chocolate chip muffins on road trips, banana ice cream with swirls of fudge winding their way through saccharine, tartrazine-coloured dairy. Ahhh, those were the days. So now, a slight improvement. The banana cake recipe is in fact my Coziest Banana Bread, just using all light spelt flour instead of half light and half whole spelt. I made this decision because we’re eating cake here, and a less dense texture was needed. If you simply cannot justify eating all sifted spelt flour, go halfsies – it will still be delicious. I also took out the chocolate chunks because there is, uh, plenty of chocolate to speak of in this cake. And speaking of which, the chocolate cake is just a simple vegan version of your childhood favourite – you could easily make this your new go-to. The nice things about both of theses cakes is that they use maple syrup instead of sugar (something I ate quite enough of way back when). I also used a flavour-neutral coconut oil for the fat, but you could use butter if you are so inclined. 1. Preheat oven to 350°F/175°C. 2. Lightly oil and dust a 7” round spring form cake pan with flour, shaking out excess. 3. Put the milk, oil, maple syrup, vanilla, and bananas in a blender and blend until smooth. 4. In a large bowl combine dry ingredients. Add banana mixture and combine using as few strokes as possible. Fold in walnuts. 1. Preheat the oven to 350°F/175°C. 3. In a large mixing bowl, sift together the flours, cocoa, baking powder, baking soda, and salt. Whisk to combine. 4. In a separate bowl combine the maple syrup, milk, olive oil, vanilla and vinegar. Whisk to combine. Pour the wet ingredients into the dry ingredients and whisk to remove any lumps. 5. Pour batter into cake pan and smooth the top. Place in the oven and bake until a toothpick inserted in the center comes out clean (approx. 60 minutes). 1. 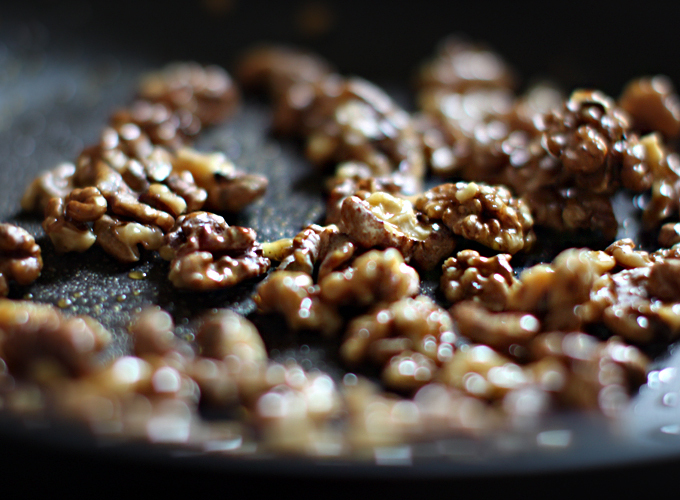 In a dry skillet over medium heat, lightly toast walnuts until fragrant. Add maple syrup to the pan and toss quickly to coat. Remove from pan to let cool. Enjoy. 1. Slice vanilla bean lengthwise, scrape out the seeds, and place them in a small saucepan. 2. Add cold milk to the saucepan and warm slowly over medium heat. When hot, remove from heat and add chocolate. Stir until fully melted, whisk in a pinch of sea salt and glaze cake immediately. If the glaze sets, simply reheat to melt again. 1. Bake cakes together, on the same rack if possible so that they cook evenly. Let cool completely. Slice each cake in half horizontally (I repeat, make sure they totally cool). You may need to slice the very tops off the cakes to make them straight. Discard (eat) the trimmings. 2. While cakes are baking, make the Maple Glazed Walnuts and Chocolate Glaze. 3. Start with one half of the chocolate cake on the bottom, spoon on about 1/4 of the glaze, with the majority being around the edge so that it oozes out when you place the next layer. Place a banana cake layer on top of the chocolate layer and spoon on glaze, repeat until the top layer. Pour the remaining glaze on the top of the cake and top with Maple Glazed Walnuts. Serve. Now I’m off to party like it’s 1999. Still got it. Looking delicious cake. I will try to make this on my birthday occasion. I made this on the weekend for a good friend’s birthday! I’ve been wanting an excuse to make it since you’ve posted it and I FINALLY had one! Amazing! Sarah, your recipes never disappoint!!! Thank you so much! You and your recipes constantly amaze and inspire me! My banana cake is yummy but it didn’t really rise! Is that normal? Can you please give me some tips? I made this cake and my goodness was it good 🙂 🙂 :). I needed to say thank you for creating new and exciting recipes. Everything I make of yours has never failed in exceptional taste. I have not yet made this cake yet, though your cozy banana bread is a staple in our house, but to ring in the New Year I made your Blood Orange Chocolate Cake from your book…Oh…My…Goodness. Thank you. Thank you. Thank you. It is looking so cool cake and I will try to make this cake at my home and your direction is easy and makes this cake on my hubby’s birthday. Thanks for sharing this article. I just made this cake, yet again. This time it was a “good luck on your first day of school” cake for a little friend who is off to kindergarten tomorrow and it was amazing. Thank you for your continued inspiration, Sarah B! For all you glutards out there, I have made this cake (successfully) without gluten! All I did was substitute the 2 cups of spelt with 1 cup of millet, 3/4 cup of sorghum and 1/4 cup of arrowroot starch. Yum! Making this cake for my good friend’s bday today. I needed to make it GF, so I used Bob’s Red Mill AP flour. Turned out great, but only took 37 minutes to cook.. They started to smell done and sure enough, the knife came out clean. Must be the GF flour? Anyways thanks for the recipe! I made this beauty for my littlest one’s first birthday party today. I didn’t include the nuts and made an avocado and raw cacao pudding-like icing. It was to die for. Both cakes were moist and flavourful! Thank you for your continued inspiration! Just made these as cupcakes (The chocolate cake recipe). Took less than 15 minutes to bake. Also used gf flour (homemade mix of Sorgho, tapioca, potato and almond). Can you use raw cacao powder in place of the cocoa powder in these cake recipes? Are they interchangeable? Love this recipe and so many of your fantastic creations. If I was to use a gluten free flour in place of spelt ie teff or buckwheat, would it be necessary to add xanthum gum or something else to hold the mix together? Would really appreciate your thoughts. All the best. made this today. i love that you use the cozy banana bread recipe as a cake – can’t get enough of that bread. literally have the recipe memorized. the glaze didn’t turn out well for me too. way runnier than pictured. should it be 400g chocolate? We made this cake and it is amazingly delicious! We also just use the banana cake recipe and make muffins with it…they are so moist and tasty (sometimes we add some nice dark chocolate pieces too)! Thanks so much for the recipes (as always this one was very inspiring)! Pingback: Miss Moss : Cake! Cake! Glorious Cake! The cake looked so good I had to make it and it was so nice. Thanks for the recipe. Sarah, the cake in your pictures look so tempting and delicious. Well, I just baked the 2 cakes but the banana one has turned out flat and more like a soggy banana bread when its warm. The Chocolate is just fine. I baked them separately as I did not have 2 pans the same size. Banana one was baked for about 40-45 minutes and chocolate one was baked for 30 minutes. Please can you tell me what could have gone wrong with the banana cake? Did i bake it for too long? Please help. Thank you so much for your precious site. Birthday cake is a part of the birthday celebrations. Many thanks for your post.I am very interested by reading this.. This is so completely beautiful and delectable and perfection for a celebration of any kind! I was however wondering whether actual vanilla beans would be an appropriate substitute, rather than the extract, because I seem to have an abundance and think the flavour would be enhanced and make it fuller and richer. Thanks for the inspiration and INCREDIBLE insight into nutrition, all the recipes and of course the exquisite photography! Thank you Sarah for the amazing recipe! This was my first time baking a cake without sugar!!! I’m so impressed I may never bake with sugar again. I made this for my husband’s 30th 🙂 My glaze really didn’t turn out – not sure where I went wrong, but other than that the cake was a hit. I also overcooked slightly, for me it didn’t need the full 60 min. I should have checked sooner, but oh well, next time. Thanks for a beautiful recipe! Happy birthday! Loving the birthday cakes! Your blog continues to inspire us all! Happy Birthday! I love glazed cakes. Plus, it’s so much easier than frosting. And maple walnuts? Yum! Sarah, Happy Birthday!! =) This cake is gorgeous. Your blog continually inspires and educates me. I wanted to make this cake for a friend who is gluten intolerant, would it work with different flours such as almond flour or a gluten free flour mix? What would you suggest? the glaze typing came out funny and in the directions, you include olive oil instead of ghee. OH my! That looks so tempting. I wanna try that one. This wonderful cake inspired me for my 22nd birthday last weekend. I threw a big party and on 12 o’clock, I reveiled my personal try of this awesome recipe – people didnt even notice that it was vegan and almost gluten free haha ;D.. Your cake looks really very delicious. 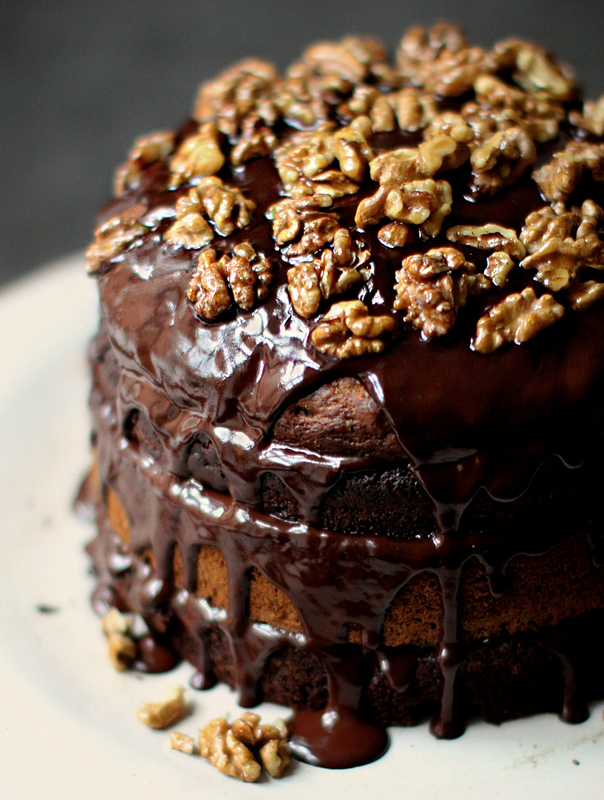 My mouth is watering by seeing this chocolate banana cake. I just love chocolate cakes and this is delightful. Happy belated birthday, Sarah! Hope this year is the best yet. This layered cake looks incredible. I laughed the dreading birthdays thing. How lucky you are that you realized so soon that the superficial things don’t matter. It took me until my late 30s to hit my stride, and now in my early 40s I am loving life and feeling the most beautiful I ever have, in spite of the wrinkles and greys peeking in. Aging has many underrated positives. A great decade ahead to you (and many more!) and thank you as always for the glorious work that you share with the world through this blog. This post is so interesting to me because banana cake and chocolate cake are my favorite cake and I am always looking for the perfect recipe. This looks so delicious that’s why I think that this the one I am looking for. if that isn’t the most beautiful scrumptious cake ever I don’t know what is? This looks dangerously good! I have been helping myself to your milkshake recipe lately when I need a sweet fix. Delish! Thanks for sharing all your goodness with us:) And Happy Birthday! I hope you had a wonderful birthday. The 30s are probably the best decade, so enjoy! The ones that come after are great too as long as we look after ourselves, as you are inspiring so many folk to do. Joyeux anniversaire, dear! Congrats on all of your success, enjoy that amazingly delicious (ok I haven’t tasted it, but am living vicariously through your gorgeous photos and vivid descriptions, as usual 🙂 cake and hope this year is even better than the last. Bisous!! happy birthday!! what a cake!! I so LOVE your blog and all the creative, delicious ideas you come up with….. keep up the great work! The world is a yummier place with you in it!! Thank you for sharing your beautiful gifts with us!! I might make your last year’s bday cake for Canadian Thanksgiving this year!! But, I KNOW I’ll be making this chocolate-banana one too!! Happy Birthday Sarah! And what a stunning birthday cake made by a stunning and inspiring woman. To the the next 30 years! I keep making banana chocolate muffins with almond pulp and I just can’t get enough of the perfection of chocolate and bananas. Can’t wait to make this cake! I turned 29 this summer and made quite a cake as well. It consisted of a layer of gluten free almond orange cake, a layer of your pumpkin spice birthday cake (very good), a layer of gluten free coconut cake, and a layer of blueberry molasses cake (101 cookbooks) with lemon curd and cherry fillings and your coconut icing. Yeah, I couldn’t decide what to make so I made them all! I also made your banana bread last weekend with coconut cream whipped up on the side. So delicious! Can’t wait to try your chocolate cake and those maple walnuts! Have a terrific birthday! a very happy (a bit belated) BDAY to my good-mood-happy-food-fairy:-)))wish u “tout le bonheur du monde (also in the gourmand-monde)” from sunny ontario…hugs! I CANNOT WAIT to try this! Sounds amazing! I love you <3 I have no words. Feel this hug. beautiful! happy birthday, sweet girl! Happy Birthday! thanks for all you words and inspiration. Please, if you have any possibility to introduce us with special equipment that you use in your kitchen (blenders, juicers, food processors, dehydrators etc) it would be very useful. I have very limited budget that is why I would like to buy the best eqiuipmnet that will last . Happy birthday ! thank you for your blog. We have the same birthday and I chose chocolate as well but now I am craving your cake! I may have to celebrate all over again! Wishing you s fabulous year! I, too, am pushing 30 and can’t wait to get older and have life settle down a bit. Thank you for the DELICIOUS looking cake (can’t wait to try it!!) and hope you have a fantastic day! Happy Birthday Sarah! Another fabulous post. 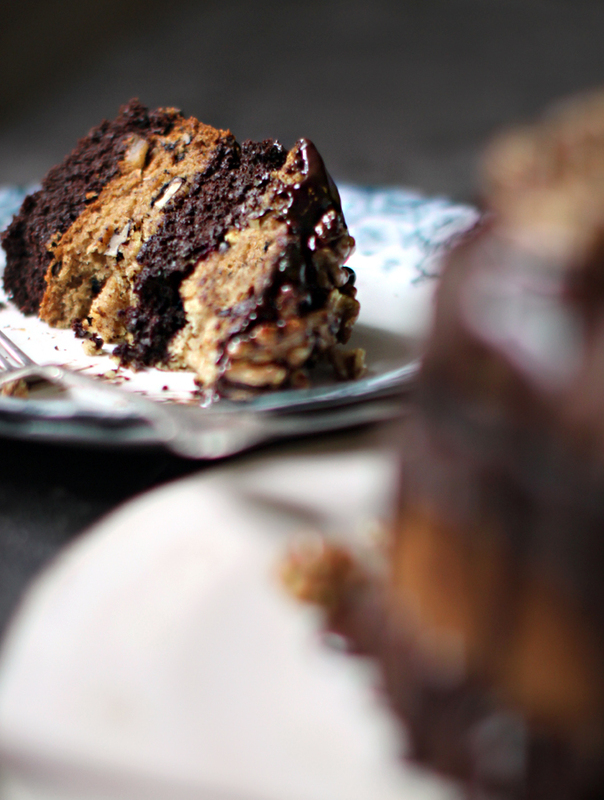 Once we’ve finished our latest batch of your amazing Raw Brownies, I’m making this cake! Love every recipe, thank you so much for taking the time to share and making my family healthy. Enjoy your 30’s, I’m about to leave mine! Beautiful blog & happy birthday! I must say. Being almost sixty that my perspective has totally changed. My life is not focused on appearances, but rather substance… Happy Birthday! Enjoy your youth! …and that cake looks fabulous! Happy Birthday!! This looks absolutely divine! Gosh… that is decadent. Looks amazing. Happy birthday and have heaps of fun! Many happy returns! Thanks for this great cake recipe…will this work using almond meal as flour substitute? again, all the best for the new decades that is about to begin, many say it is the best! I wish you have more tasty moments in your life! Happy birthday, Sarah! Lovely lokking cake. Happy B day! Happy 30! Thanks for posting this cake because tomorrow is my birthday 9/29 and I’m turning 40 and looking for the perfect cake to celebrate. I love what you said about turning 30 and realizing certain things dont matter anymore. So true! Happy celebrating! Happy birthday, Sarah! 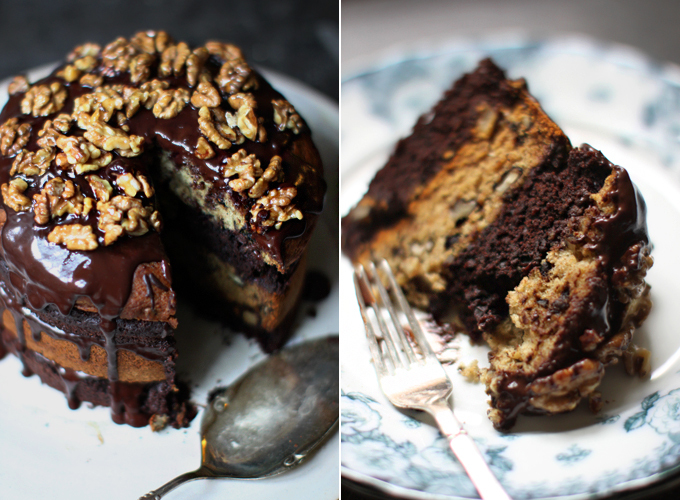 I’ve never had a chocolate banana cake but I sure like the looks of yours, especially with the maple glazed walnuts on top! I agree with you about using all light flour for a birthday cake. Happy Birthday! Thank you for finding and embracing your passion, you truly are a gift to the world! yay! Happy birthday! This cake looks delish! Happiest of Birthdays! I loved turning 30 as well-it was so freeing! This looks so delicious! Happy Birthday! Happy birthday!!! I turned forty last year and am having more fun than ever – hope your thirties are as amazing as mine were!!! Happy birthday! What beautiful, beautiful photos. Hope the 30s are even better than the 20s! Congrats! Wish you the happiest life. Happy birthday. Enjoy those delicious cakes. So devine. The 30’s is a great decade – have fun. Wohoo…happy birthday to you. Two of my favourite flavours too, and i love the fact you’ve kept them seperate as i tend to just mix them up together! I reach the big 30 next spring and i have a very similar philosophy to you. Bring it on, i’ve only just begun!! Happy Birthday, Sarah. I will try to make this cake on my son’s birthday. He will LOVE it. Happy birthday! I just turned 30 this summer and I’m loving it! The cake looks fantastic. A very happy birthday to you Sarah. Thanks for yet another brilliant recipe. HAPPY BIRTHDAY SARAH B!!! Your cake is beyond gorgeous, and I can’t wait to try it out for a special occasion. I bet 30 is going to be a great year for you! Happy Birthday! This cake looks perfect. It took me until 31 to figure out that getting older is great. Hope you have a wonderful day! WHOOP! Party time 🙂 Happy birthday, Sarah. To many more healthy, happy years ahead (and so. much. delicious. cake.). Enjoy you’re 30 years – it’s a real great age, believe me! I’m not so into bananas, normally, but if YOU give a recipe with bananas, I know that I have to try it. And I will. I love your ability to make healthy look soo dangerously delicious: ) I hope you have an outrageously spectacular day!! Happy Birthday, Sarah! I’m a first-time commenter but long-time reader and lover of this here blog of yours! In fact, banana bread was the first of your recipes I ever made! I’ve enjoyed many MNR inspired eats since then, and my recipe book is chock full of MNR print outs. Thanks for sharing and for helping to teach this girl how to truly eat well! Cheers to many many more happy birthdays! Happy birthday, Sarah! I hope you have a delicious year ahead. Everything does get better with age, I can guarantee it. And that cake? Oh my, girl…… killer stuff there. Happy Birthday! My boyfriend turns 30 today, too! Enjoy this delicious looking cake. It makes me want to lick the screen! Happy Birthday! I don’t think I can wait until the next birthday to enjoy this yummy cake, though. It looks awesome! Happy Birthday Sarah,might try this one!! Happy birthday, Sarah! 🙂 I laughed when you were talking about how you used to dread birthdays, because I’m still at that stage in my life. I’m in my mid-twenties and hate the sound of it. Early-twenties doesn’t sound too bad..but mid-twenties!? Ugh. I figure it starts getting better once you have your life figured out a bit more, though. And I’m looking forward to that aspect it. Happy birthday Sarah! I don’t think this cake could be any more perfect. Enjoy it and have a great time celebrating. I agree with you – it just gets better as we go. Love, love, love totally!!! Happy birthday!! The cake sounds fabulous. Hope we’ll see you soon. Oh gosh this looks AMAZING. Happy Birthday! OMG! That cake is spectacular. I’m so making it tonight!! Hope you have a wonderful day! Thanks for the delicious recipe. Cheers! Happy Birthday! You’re right, your 30s are a good time. Welcome to the club. What a spectacular-looking cake. Happy birthday! Happy Birthday!!! That cake looks absolutely divine! Keep going, your blog is great! What a beautiful cake, the pictures are really mothwatering! Happy birthday to you! I think you’re spot-on with your attitude about getting older — and with this cake. I hope it’s a wonderful year. Cheers to you! I wish it was my birthday! Love this cake! Happy Birthday! This cake is gorgeous! Happy birthday! 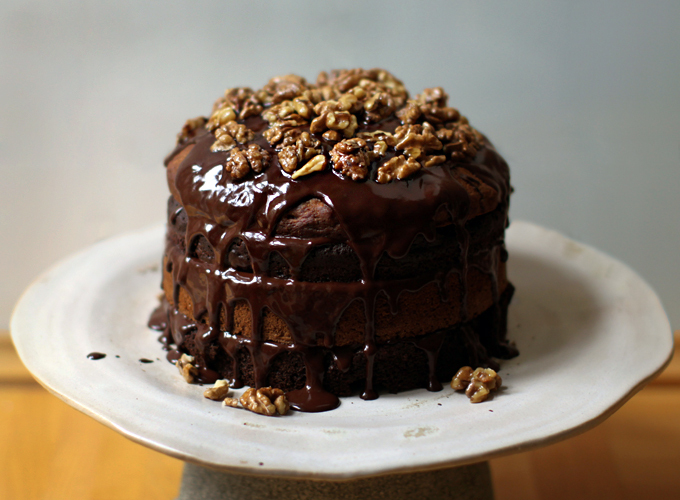 What a genius idea to combine chocolate and banana cakes together – and love the idea of maple walnuts. Wowza! HAPPY BIRTHDAY! I will be 31 in a couple weeks and still can’t call myself a “woman” without giggling. Cheers to you, a fellow Sarah Libra, and cake baking genius! Happy Birthday Sarah!! your cake looks amazing and your outlook on life and age amazing as well. I have heard this before from some of the wonderful women in their thirties that I know, that life improves with age, which they never would’ve guessed in their twenties. This is heartening to me turning 25 this year; that life is just getting started and will continue to grow more beautiful. Thanks for sharing and have a spectacular day! It looks soooooo yummy! I think i won’t wait for my birthday to try that on!